Boyd was apparently unaware that he was being followed so closely, and his camp, while guards were posted, was not particularly alert. Pickens advanced, leading the center, while his left flank was under the command of Elijah Clarke and the right was under John Dooly. Gunfire between Patriot scouts and the camp guards alerted Boyd to the situation, who managed to form a defensive position atop a hill, and surprise Pickens. Flanking maneuvers by Clarke and Dooly were slowed by the swampy conditions, so they did not immediately arrive on the battlefield. Things at first went badly for Pickens, but then a lucky musket shot hit Boyd, mortally wounding him, and the Patriot flanks began to emerge from the swamps. The Loyalists, led by Boyd's second in command, William Spurgen, fell back, but the disorganized retreat rapidly became a rout. Pickens took 75 prisoners, and about 70 Loyalists were killed, while he lost 32 men. Five of the captured Loyalists were hanged when it was established that they had violated a Patriot oath taken earlier in the war. Quite coincidentally, Campbell decided on February 14 to abandon Augusta. Campbell did not learn of this battle until after he had already left Augusta; he probably left due to the arrival of more militia companies in Williamson's camp. The battle clearly demonstrated the limits of British power, and its ability to protect Loyalists outside their immediate protection. 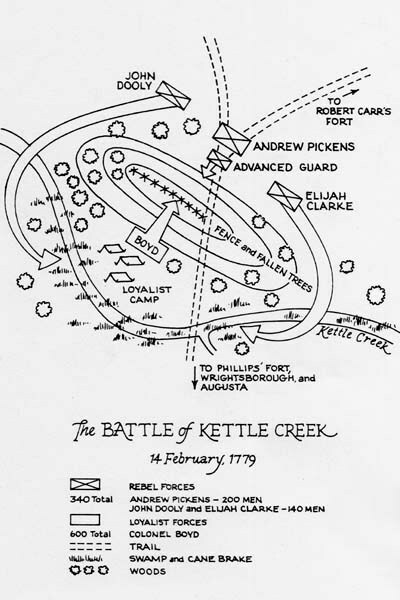 The success of Kettle Creek was undone by the later British victory at the Battle of Brier Creek, which took place nearby in present-day Screven County. The backwoods frontier of North Georgia held challenges for the British Army. As Britain prepared to withdraw from Augusta Colonel James Boyd was ordered to scout the area. Word had reached the British that a few hardy farmers in North Georgia had set up a government at a place called Fort Heard (present-day Washington, Georgia). When 700 loyalists set up camp along Kettle Creek on February 14, 1779, less than a day's march from Fort Heard, they knew to be prepared for an attack. Only a couple of days before, on February 11, 100 Patriots attack them while crossing Van(n)'s Creek in spite of the patriots being heavily outnumbered. Things were not going well for the Loyalists. Boyd expected additional men to assist in a strike against the Patriots. His men are not regulars and dissension filled the ranks. And the skirmish at Vann's Creek alerted Colonels John Dooly and Andrew Pickens to the Loyalist's presence in Wilkes County. As was the custom, the Loyalists sent scavengers out to find food. This morning about 150 men were out searching for food when Pickens attacked there camp near Kettle Creek. With a combined total of 340 men, the Patriots attacked in three columns, Col. Dooly on the right, Pickens in the middle and Elijah Clark, Dooly's second in command on the left. A small advance guard is sent in front of the columns to scout the enemy. Col. Pickens scouts were surprised by Boyd's Loyalist sentries and opened fire. Alerted to the attack by the sound of gunfire, Boyd rallied his men and advanced with a small group to the top of a nearby hill, where they waited behind rocks and fallen trees for the Patriots to arrive. To the left and right the men under command of Dooly and Clarke began having problems crossing the high water of the creek and nearby swamps. Pickens continued his advance to the fence on top of the hill, where Boyd's men awaited the advancing Americans. On the approach of Pickens, the Loyalists opened fire. Men at the lead of the Patriot column fell victim to the first rounds. Clarke and Dooly, unable to advance quickly through the cane, were helpless. By all accounts, outnumbered and caught by surprise, the Patriots were clearly losing the battle. After the successful ambush, Boyd ordered his men to retreat to the camp by Kettle Creek. In one of those events frequently labeled as fate, Boyd falls to the ground, dying from a musket ball. Seeing this, his troops panic and an orderly withdrawal turned into a nightmare for the 600 men under his command. 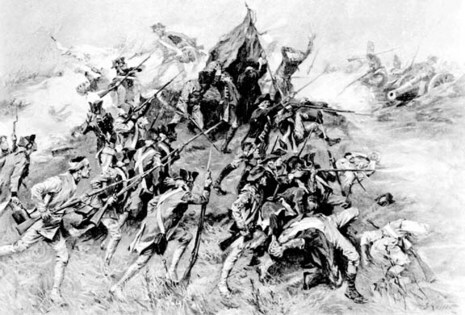 Pickens rallied and advanced his men towards the Loyalist camp. At the same time Dooly's men emerged from the swamp. Surrounded on three fronts, with the creek to their back, about 450 Tories followed Boyd's second in command, Major Spurgen, across Kettle Creek. While the Loyalists crossed the creek, Lt. Col Elijah Clarke emerged on the other side and charged with 50 men. The Loyalists flee, soundly defeated. Total losses: Loyalist 40-70 dead, 70 captured, Patriots 9 dead, 23 wounded. The men who fled the battlefield eventually made their way back to Wrightsville, although some were captured and hung later that year. Pickens, who became famous for his many battles in the Revolution would later write that Kettle Creek was the "severest chastisement" for the Loyalists in South Carolina and Georgia. Dooly was later brutally murdered by British Regulars.